Star Wars fans have followed the legendary Millennium Falcon since the hugely successful film franchise first wowed cinema-goers on the big screen in 1977, but what do they know of its engineering and its past? Now the YT-1300 Millennium Falcon Owners’ Workshop Manual, a new book from Haynes, describes in detail the vessel’s evolution – from common freighter to luxurious pleasure craft to the fastest hunk of junk in the galaxy...! 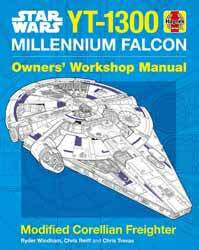 Star Wars: YT-1300 Millennium Falcon Owner's Workshop Manual is another in the Haynes series of Owner's Workshop Manual series. The book, which is fully authorized and approved by Lucasfilm, is the most thorough technical guide to the Millennium Falcon available. It traces the history of the Corellian Engineering Corporation’s (CEC) YT series of starships, and the development of the YT-1300 model line before focusing on the Millennium Falcon, providing the ultimate guide to the YT-1300’s history, systems and operation, with the aid of numerous photographs, plus line art, floor plans, exploded diagrams, and computer-generated artwork. Normally these books are seen as stocking filler items; the sort of publication you eventually pick up in a remainder bookstore for a couple of £s. But this book isn't a lightweight, quickly thrown together affair. A lot of real love and attention to detail has been lavished on the design and production. If you're a real fan of Star Wars and love discovering more details about the technology, then this is the perfect book for you. It's designed so that it reads just as well if you open a page at random or read it from cover to cover.